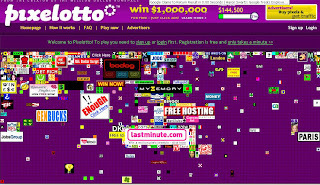 Pixelotto--Alex's follow up to his milliondollarhomepage. money!" in which among other things I had talked about the milliondollarhomepage created by Alex and how he made a million dollar by selling pixels. And as I had mentioned in those articles after the success of the milliondollarhomepage many copy cats sprung up. But none could reach the one million dollar mark. It was not just the unique idea that earned Alex the one million dollar but it was also the result of some well executed marketing and promotional strategies which in itself is unique. After the milliondollarhomepage was sold out Alex had clearly stated that he was already onto something similar but with a different strategy. And I been curiously waiting for him to unearth his next brain child and now it has arrived in the form of his new website which is Pixelotto.com. registered users. With every click the user makes on the Ads, the user gets a lottery ticket which allows him to participate in the lucky draw for a million dollar! This means more visitors to the site and more registered users and more clicks on the Ads. No wonder this time the advertisers are paying $2 per pixel where as in the milliondollarhomepage it was $1 per pixel. And also this means after sharing the one million dollar with the users, Alex will again stand to make a million dollar. Anyone can register and registration is free. Just visit the site and sign up. You are allowed 10 clicks in a day which gives you that many tickets and thus increasing your chance. If you click for more than 10 times in a day only the first 10 clicks are accounted for. Users have to be above the age of 16. According to the site "A month after all the ad space is sold, one ad is selected at random and a winner is chosen from all those people who clicked that correct ad. A millionaire is made! The winner will also get to nominate a charity of their choice to receive $100,000.". So one also has to make sure they click on all the Ads at least once before the draw is made. This is a very clever technique to make sure that every Ad on the site is clicked by the visitor at least once. Along with all the buzz about Alex launching his new website there are also reports that the website is not taking off as expected. Let us wait and see.